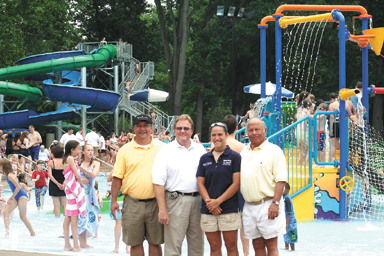 Bexley Parks and Recreation Director Doug Jackson, Building Director David Long, Aquatics Director Natalie Contosta and Mayor David Madison welcome residents to the city’s new pool on Memorial Day. The $3.5 million project, which replaced 44-year-old facility, has earned a superior rating award from the Ohio Parks and Recreation Association. Two water attractions that opened in eastside communities this year have made a splash beyond their boundaries, earning awards from the Ohio Parks and Recreation Association. Bexley’s swimming pool, which opened Memorial Day, and the Barnett Park "sprayground," which began operations in July, received superior ratings in categories for projects in the $1 million-$5 million and $500,000-$1 million categories, respectively. The $3.5 million Bexley project replaced a pool and other amenities that had been constructed in 1963. In the award application, Aquatics Director Natalie Contosta pointed out that, after 42 years of operation, serious maintenance problems had arisen, and that the pool was losing four inches of water a day, three more than is typical. The pool mechanics were also subject to malfunctions. The rest rooms were "dark, dingy and very unwelcoming," Contosta reported, and the staff break area did not even have a changing area. After convincing city officials that the maintenance issues necessitated replacing the pool, recreation staff members convened three public meetings starting in 2005 that helped determine the design of the new facility. Residents, particularly those with the Bexley Swim Team, expressed a strong preference for an eight-lane competition pool, along with a separate leisure pool, slides, splash pad and tot pool, as well as new rest rooms and concession stand. With a tight budget of $3.5 million, construction began in September, 2006, with a completion target for May, 2007. A mild winter allowed crews to make early progress, but things did not always go swimmingly. The planners replaced their building contractor in December over higher than expected cost estimates, and design had to "start over from scratch," according to the report. Steel for the slides arrived 18 days late in April, setting back the installation of irrigation systems and landscaping, but crews were able to complete their construction three days before opening. The entire project was completed in eight months and 15 days. The May 28 unveiling attracted a record crowd of 1,339 residents. Recreation staff had set goals of increasing memberships by 200 and doubling daily attendance and revenue. Family memberships actually more than doubled, at 934, representing a quarter of the city’s population, as did the total attendance. The project was completed without raising taxes, with council opting to finance the construction with money from the general fund and through bonds. 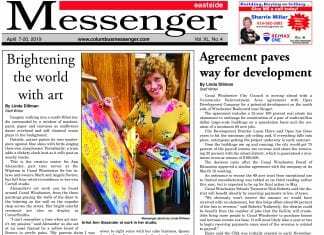 Contosta added numerous special events to the summer schedule, including movie nights and evenings for adults and teens, and she plans to continue these in 2008. The Barnett "sprayground" provided youngsters with another place to cool off, featuring fountains, water jets and other toys. The zero-depth surface eliminated the need for lifeguards, but the attraction was supervised by recreation staff members. No additional "spraygrounds" are planned for 2008, according to Columbus Recreation and Parks spokeswoman Terry Leist. And while Columbus plans to close seven of its pools next year as a budget-cutting measure, the remaining pools will offer free admission. The respective recreation staff members will receive their awards from the non-profit organization at a ceremony in Dayton in February.